Tillakaratne Mudiyanselage Dilshan (Sinhala: ???????? ????????????? ???????? ; born October 14, 1976 in Kalutara, Sri Lanka) is a Sri Lankan cricketer and a former captain of the Sri Lanka national cricket team. 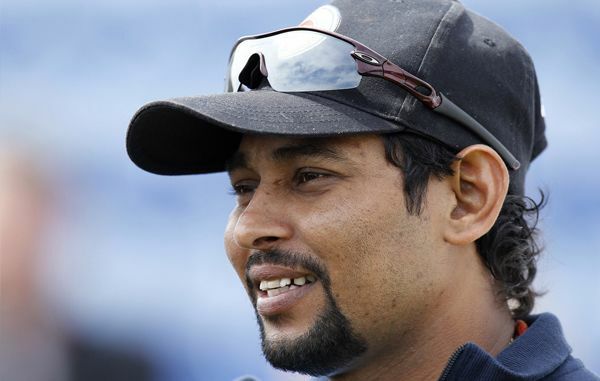 Dilshan made his Test and ODI debut during the Sri Lankan cricket teams tour to Zimbabwe in 1999. He is one of the most innovative batsmen of the modern game for his different stroke play, mostly in T20 arena. He is an aggressive right-hand batsman who invented the scoop, which has come to be known as a dilscoop, that hits the ball behind the keeper. He is also capable in bowling; his off breaks are mostly used in the one-day arena. Dilshan won the award of Twenty20 International Performance of the Year at the 2009 ICC Awards for his 96 off 57 balls against West Indies in the semi-final of the 2009 ICC World Twenty20 in England. He also won man of the series trophy for his individual batting performances in the 2009 ICC World Twenty20 tournament. He was also a key member of the team that won the 2014 ICC World Twenty20 and was part of the team that made the finals of 2007 Cricket World Cup, 2011 Cricket World Cup, 2009 ICC World Twenty20 and 2012 ICC World Twenty20. He is also regarded as one of the best fielders of the modern game, as Australian David Warner, Indian Virat Kohli, and South African AB de Villiers. He usually fields at the point region. Tilakaratne Dilshan with family wife and son. Dilshan was born in Kalutara to a family of a Malay father and a Sinhalese mother. He had his education at Kalutara Vidyalaya, Kalutara, where he started his cricket career as a teenager. Dilshan converted from Islam to Buddhism at the early age of 16, and was known as Tuwan Mohammad Dilshan before his conversion. However, his childhood coach Ranjan Paranavitana said even though Dilshan carried a Muslim name, he and his brothers and sisters followed their mothers religion from their childhood and once his parents separated he officially changed his religion and name. He is now married to Sri Lankan teledrama actress Manjula Thilini. Their marriage was celebrated in India during the 2008 IPL series. Dilshan has two daughters from his second marriage and a son from his first marriage. Dilshans brother, Tillakaratne Sampath, is a first-class cricketer in Sri Lanka. Dilshan played his test debut against Zimbabwe on 18 Novermber 1999 at Bulawayo. He scored only 9 runs, immediately lbw to Henry Olonga. However, he scored his maiden test century on the same series, in the second test. He scored an unbeaten 163* runs in the first innings, guided the team for the victory. Until retirement on 2013, Dilshan has played 87 test matches with 5,492 runs along 16 centuries and 39 wickets. His highest test score was at England, where he scored 193 runs at famous Lords cricket ground, against England. During the same tour to Zimbabwe in 1999, Dilshan also played his debut One-Day International against Zimbabwe on 11 December. He scored only 31 runs in his debut match. His first ODI century was against Netherlands on 4 July 2006. He smashed unbeaten 117* runs along with Sanath Jayasuriya, where Sri Lanka posted the highest ever ODI team score with 443 runs. 1st t20 aus v sl dilshan best cricket shot ever? Dilshan announced his retirement from Test cricket on 9 October 2013. However he mentioned that he will continue to play in the shorter format of the game until few international tours after 2015 ICC Cricket World Cup.